Nutz and Jackie have been adorning peoples bodies with art and modifications for well over a decade now, with their studio going from strength to strength and Nutz winning several awards for different styles of work. As well as tattooing, Jackie is also a professional body piercer. Be it your first earlobe piercing or something more adventurous, she can cater to your adornment of choice. Her loyal following of customers showcase a wide range of body modifications, and her passion for the perfect piercing. 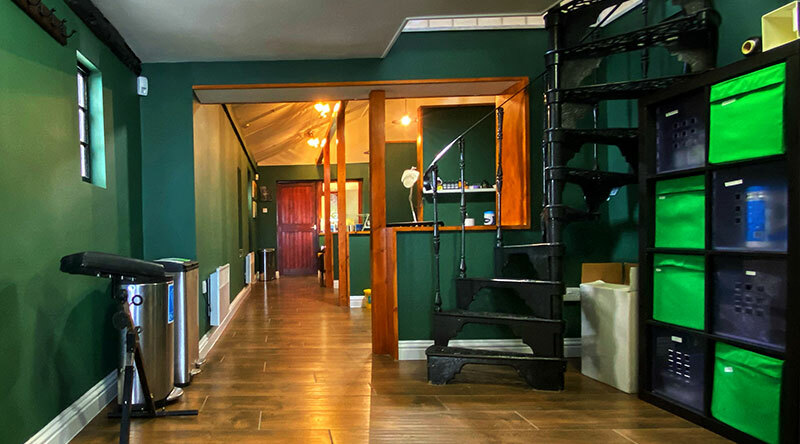 If you are interested in getting tattooed by Nutz or Jackie you need to come down to the studio with as much information about your design as you can (pictures, sketches photos etc). You can get the ball rolling with an email though if this is easier. This helps us to give you the best tattoo possible. We only book up work a maximum of 3 months at a time. The customers who we have already started work on, will get first priority to get them finished, then we will only be taking on new work as we finish old pieces. This way, people won't be waiting months (or even years) to get their tattoos finished. It also gives us a chance to do fresh work more often. Large custom work (sleeves, back pieces etc) is now rarely on an hourly rate. It’s best to book either a "full day" of tattooing .12 – 6pm. Or a "half day" of tattooing 12-4pm or 2-6pm. The price includes drawing time, breaks etc. An hour or 2 just isn't long enough to get a good chunk of work done on large custom pieces and they end up taking too long to complete Smaller custom work and "flash" type work (designs picked from our design books) will be priced on the design based on the amount of time it will take to complete. You WILL be required to pay a cash deposit when you make a booking. The amount of deposit required will depend on the price of the tattoo you’re getting done. We require 48 hours notice for a cancelation or change to your appointment or design. Less than this will result in loss of your deposit. So make sure you’re 100% certain before you commit to the booking. 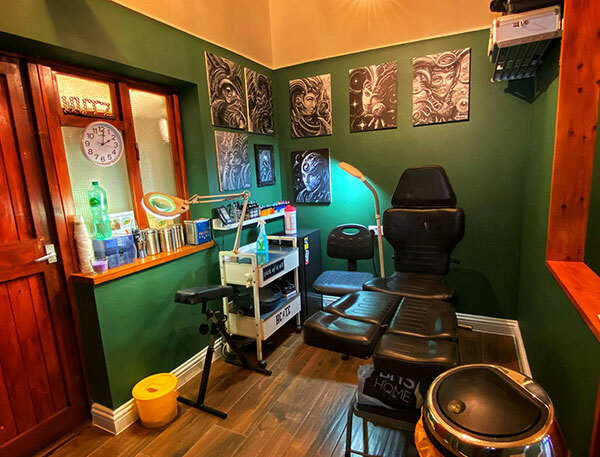 At Nutz Tattoo we pride ourselves on a high standard of hygiene and as a Professional Piercer, Jackie only use the best quality equipment and jewellery for body piercing. We are registered with the East Herts District Council Health Authority and our premises are inspected regularly. FULL ONSITE AUTOCLAVE STERILISATION is carried out. Each piece of jewellery is individually sterilised in a sealed packet prior to piercing. A new needle (sealed packet) is used every time and disposed of after use. All equipment i.e. clamps etc are also individually sterilised in separate packets and new surgical gloves are worn every time. 316L surgical steel and 9ct gold is illegal for initial piercings due to the higher nickel content which does not conform to the E.U nickel sensitisation law (E.U. directive 94/27/EC). It may be used in healed piercings only. Instead, we use medical grade titanium Ti 6AL 4V (used since 1950 for medical implants), niobium (less nickel than titanium), Implantanium (low nickel surgical steel), P.T.F.E. and titanium nitride coated over titanium (as used in hospitals to coat pacemakers, and orthopedic implants etc). All these conform to the E.U. nickel directive. Here at Nutz Tattoo we require our piercing customers to be of a minimum age of 16. Added proof will be required to show the age of 18 years for genital piercing. I.D. will be required if you appear to be under age. With parental consent we can pierce an ear or navel of someone under 16. But this is down to Jackie's discretion. We will not pierce anyone under the influence of alcohol or drugs. Anaesthetic (numbing) can be used in the procedure if requested. 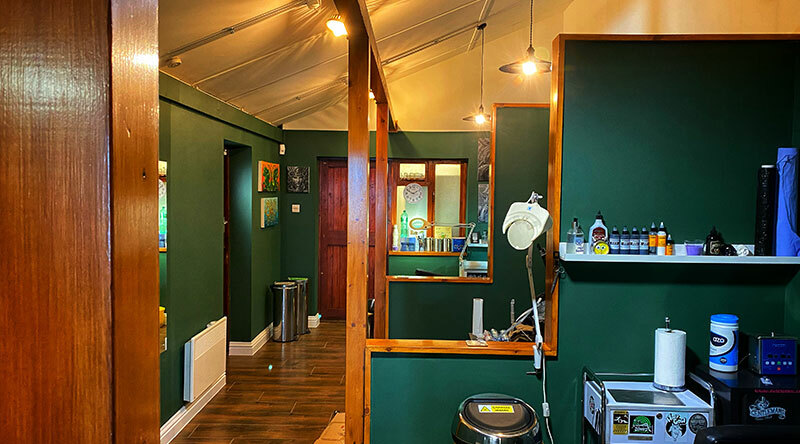 You don't usually need to book for a piercing since they don’t take much time to do, but since Jackie's daily schedule consists of tattooing as well as piercing it's best to call ahead to make sure you're not kept waiting.